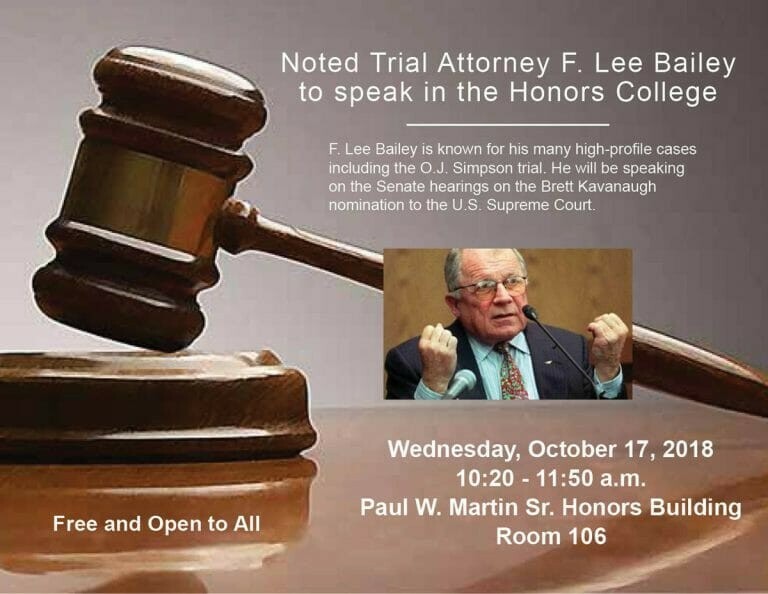 F. Lee Bailey will be speaking at MTSU next week, discussing the U.S. Senate hearings on the Brett Kavanaugh nomination to the U.S. Supreme Court. The talk is open to the public and MTSU community, but seating will be limited. A political science class and political science Chair Michael Federici’s Constitutional law class will be in attendance. “He’s something of a legal legend,” said John Vile, University Honors College dean and former political science chair, speaking of Bailey. The attorney was one of 100 key figures in a two-volume book titled “Great American Lawyers: An Encyclopedia,” published for Vile in 2001 by ABC/CLIO. Vile was editor of the publication. “He (Bailey) established himself very early in his career and he became a very skilled criminal lawyer,” Vile added. The noted attorney’s MTSU visit coincides with speaking at other colleges and universities.